Welcome back to another round of car boot beauty booty! 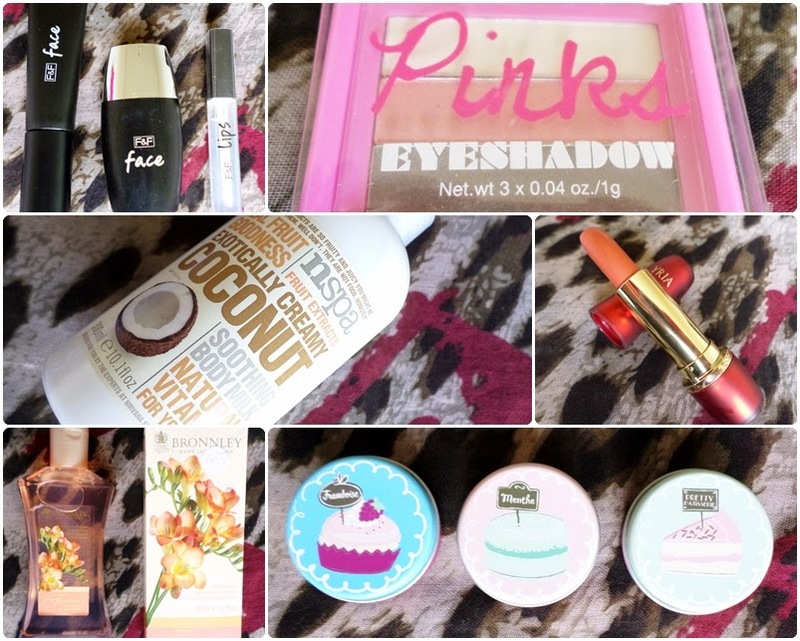 I'm quite pleased with this week's assortment of products and best of all, everything was super duper bargainlicious! I always seem to enjoy the nspa fruit extracts bath and body care range (see my review of their raspberry bath & shower gel here) but I've never tried anything from the coconut line before. This coconut body milk smells incredible and exactly like coconut. I'm not sure I've ever tried a body milk before so I'll be interested to see how this compares to a regular body lotion. I'm guessing this body milk will be lighter than a typical body lotion but hopefully it will be very moisturizing. I like the simple packaging and the pump dispenser should make applying this quick and mess free. It only cost me £0.40p whereas nspa products can usually be picked up on a 2-4-£4 offer at Asda. This Yria Rouge Grand Comfort lipstick in the shade Cuivre 201 seems to be a French version of the popular Yves Rocher lipstick line which is available here in the UK. It's actually a very nice shade, a bright peachy coral with a warm orange undertone. The packaging feels elegant and it looks different to any other lipstick I own. This was only £0.20p so once again, definitely a very reasonable buy and one that I'm almost certainly going to enjoy using. The Tesco Florence and Fred make-up range was discontinued earlier this year but I never got around to trying any of it whilst it was still in stores. I was really happy to pick up these three products to try for only £0.10p each. The first product the Galaxy Shine Finish Illuminator and it's a cream highlighter. This would be ideal mixed with foundation to give a light diffused and dewy effect to the skin. It could also be applied across the cheekbones as a highlighter. I still need to test this out properly but I do think this has the potential to be a nice product. The foundation isn't something I'm super excited about as I only realized after purchasing that it contains parabens. But I'll still more than likely give this a try as parabens are in more products than I would care to imagine and they're not proven to be dangerous. It's in the shade fair and it looks like it might be light enough to be a good match for my pale skin. The lip gloss is a basic clear gloss which is always useful and something I'm glad to have. As these three products were so inexpensive there really isn't much to loose if I don't like something! Over the years, I've noticed that H&M actually do some decent makeup and this little eyeshadow trio looks cute and wearable. The white shade will make a good brow and inner corner highlight, the taupe brown color will be good for defining the crease with and the pink is a nice all over lid color. I paid £0.20p for this and think it's brand new. These little H&M eyeshadow trios usually retail for around £1.99. I've already admitted to having a major lipbalm problem and here's further proof: I still felt the need to add three more to my already large collection. But at £0.10p each, I don't feel too bad about it. These were originally part of a Boots Christmas gift set and are dessert themed and scented which is cute. They feel comfortable on the lips and seem to be quite moisturizing. I also like the different colors. Did you brave the cold today and venture out shopping anywhere?